The Import Dialogue is where you choose which photos to add to your Lightroom catalog to organize and edit them. You’ll probably end up opening the Import Dialogue a lot — each time that you’ve returned from a photo shoot and you’re loading images onto your computer. The easiest part of the Import Dialogue is the tab on the left-hand side. This is where you choose which photos you want to open in Lightroom, simply by clicking on the folder (or memory card) where they currently reside. There’s not too much to say here, except that you may notice something interesting: It’s not just your memory card that shows up here. 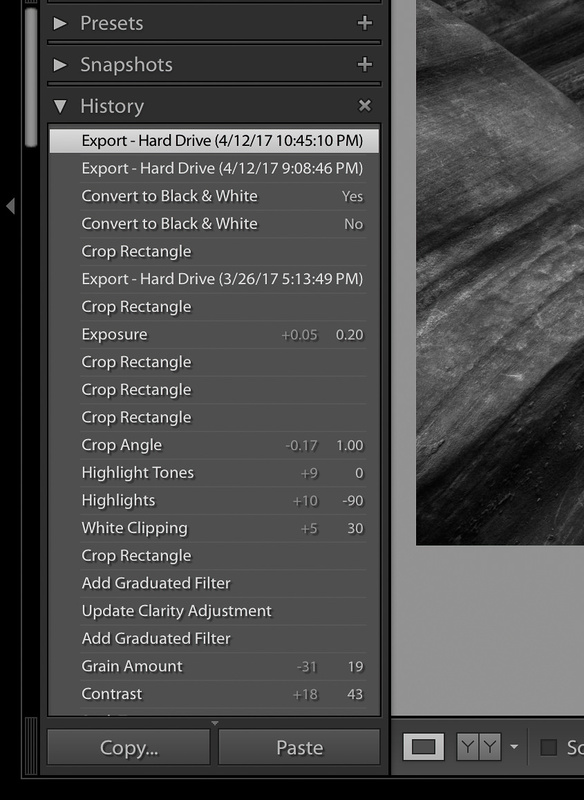 If you’re trying to import a photo into Lightroom that’s currently on your Desktop, or in your Downloads file, or anywhere else, you can do so without a problem. The top of the Import Dialogue gives you a few more options. Specifically, there are four different ways to import your photos into Lightroom’s catalog: “Copy as DNG,” “Copy,” “Move,” and “Add.” Each one is there for a reason, depending upon what you want Lightroom to do with your photos. Add is great if you don’t want to move the actual file on your computer to a new location; you simply want the photo to show up when you open Lightroom. This is ideal if you have a photo that’s already in the right place on your computer’s hard drive. Move is best if you’re trying to add one of your photos to your Lightroom catalog, but it’s not in the right place on your computer. So, if one of your photos is on your Desktop, but you want it to appear under Photos > 2017 > April, you can move the photo to the proper location, while simultaneously telling Lightroom to add it to your catalog. Copy is best if the photo you want to add to your catalog isn’t in the right location yet, but you still don’t want to delete it from its current location yet; instead, you just want to duplicate it somewhere else. This seems odd, but it’s actually quite useful. When I’m loading photos from someone else’s flash drive, I don’t want to move the photos from their flash drive onto my computer (since that would effectively delete them from their original location). Instead, I simply want to create a duplicate of the photos and put it in the right spot on my computer. 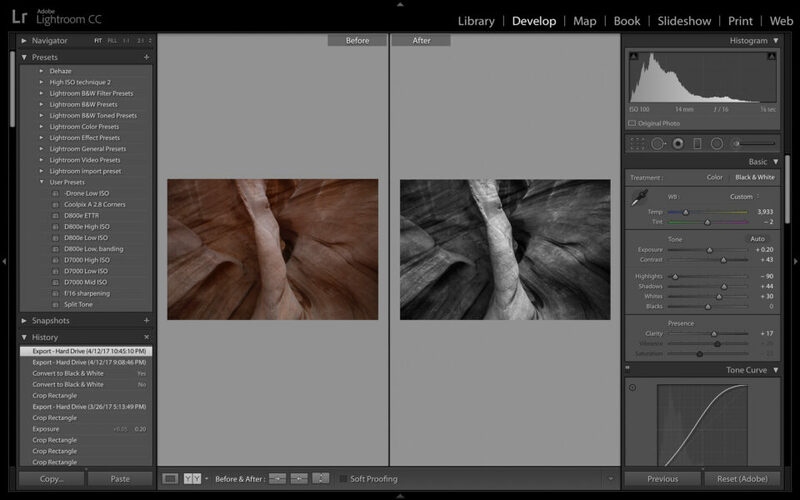 Ultimately, the duplicated file is the one that Lightroom adds to your catalog. There are a lot of options along the right-hand side of the import dialogue. 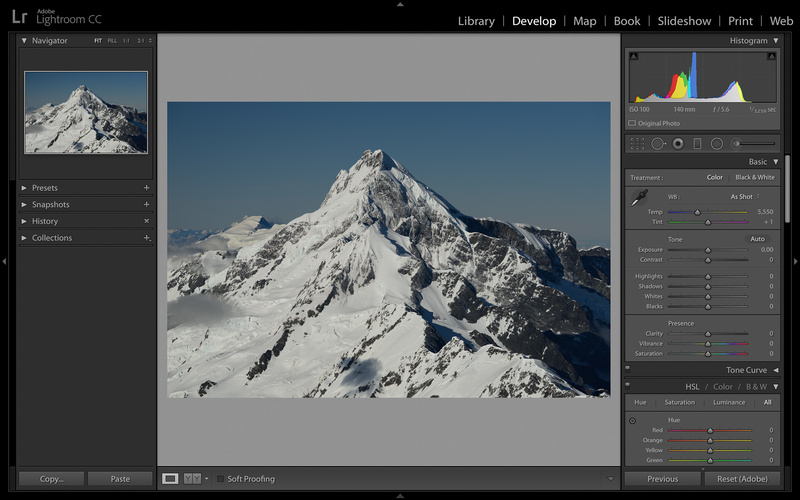 It can seem overwhelming if you’ve never used Lightroom before. Beyond that, the rest of the options are up to you. 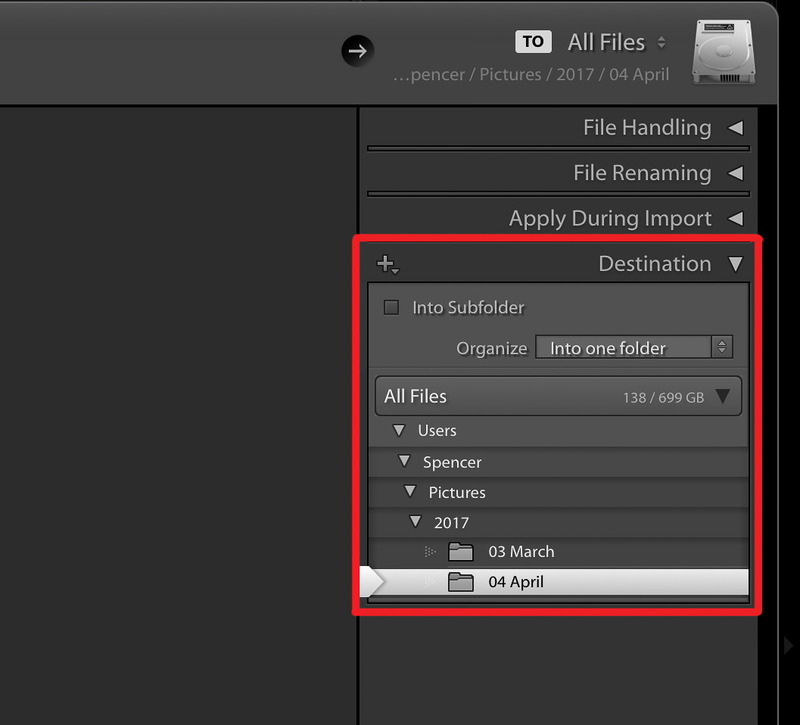 You can choose to rename the files you’re adding, which could be helpful for organization purposes. You can apply a set of “develop settings” to the photos you add — say, applying a pre-chosen amount of sharpening and noise reduction to each photo — or a “metadata” setting, such as filling in the copyright section of each photo you open. You can choose to create a second copy of every photo you import so that you have a backup (though this may be overkill if you already have a constant backup to an external hard drive or the cloud). You’ll find yourself personalizing this section significantly over time. If you’re interested in more information about some of these options, you may want to read our full article on the Lightroom import dialogue. For now, once you’ve chosen the right destination folder, you’re good. Every single one of these settings is reversible at any point in the future. The last bit of the import dialogue is the bar along the bottom. The main option here is the “Import Preset” section. This is what lets you save all the settings you just chose — the copy/move/add settings, the destination folder, the options on the right-hand sidebar — and use the exact same ones at some point in the future. Aside from that, once you’ve selected all the photos you want to add to your catalog, you’re done! Click the “Import” button at the bottom-right of your screen, and you’re ready to organize and edit the photos you’ve just added. 5) After Import: How is Lightroom Arranged? 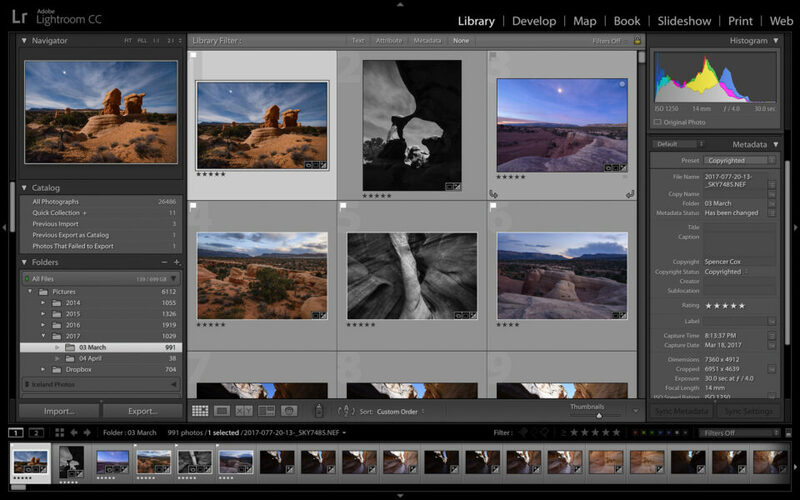 Broadly speaking, Lightroom is divided into two main sections: the organization half, and the post-processing half. These two core features are separated from one another when you’re looking at a photo in Lightroom; you can’t see all the organizational features and all the editing features at the same time. To organize your photos, you need to enter the Library module. To post-process your photos, you need to enter the Develop module. 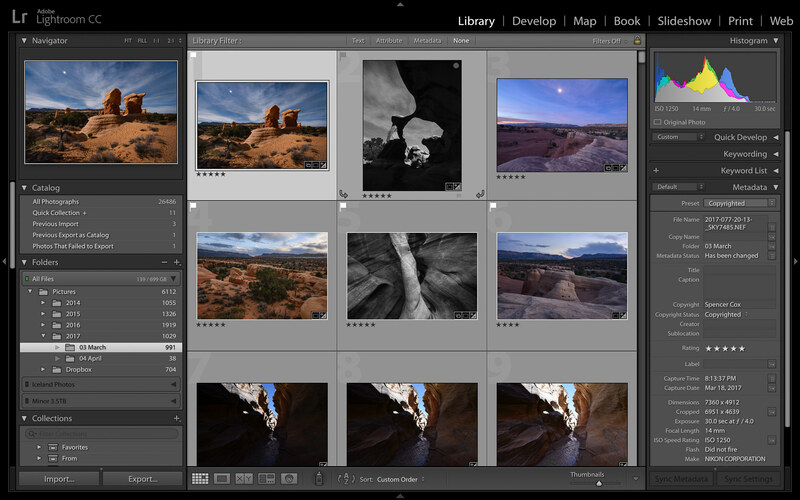 On top of the Library and Develop modules, Lightroom also has a Map, Book, Slideshow, Print, and Web module. Each one does, roughly, what it sounds like. If you want to pinpoint the GPS coordinates of a photo you took, for example, you’d need to open the Map module. We have a full article dedicated to explaining Lightroom modules if you’re interested. Along the left-hand side is the actual file structure on your computer. (If you don’t see it, press the “tab” key on your keyboard, or click the inward-pointing arrow along the very far left.) In the example above, you can see that the photo I’ve clicked is tucked away in my Pictures > 2017 > 03 March folder. Near the bottom of the screen, still on the left-hand side, you can see a label called “Collections.” I’ll get to that in a bit, but here’s a spoiler alert: The “Collections” section of Lightroom is very important. For many photographers, it forms the backbone of their organization structure. I’ll cover it in more detail later. At the top of the screen, below the Library/Develop/Map/etc. modules, is a thin gray bar called “Library Filter.” If you don’t see it, press the “\” key on your keyboard, or go to View > Show Filter Bar. Another spoiler alert: This unassuming tab is the main tool at your disposal if you ever lose a photo and are trying to find it again. On the right-hand side of your screen is another pop-out tab. This one has a few more options — Quick Develop, Keywording, etc. — and exists mainly to give you information about your photos. The most useful of these options is the “Metadata” section, which lets you look at the behind-the-scenes information about your photos. I use this whenever I’m trying to see when I captured a photo, or if I used exposure compensation, or if I used a particular camera/lens rather than another. At the top of the right-hand tab, you can see a summary of this information, as well as a histogram of the photo you’ve selected. The thumbnail view — the icon on the far left — is also known as the Grid View. This one is useful if you’re trying to scroll through several photos at once. There are also Compare and Survey views if you want to compare multiple photos against one another at the same time. And, if you take a lot of photos of people, you might find the People view — where Lightroom tries to find people’s faces and group them together — to help for certain shoots. I don’t tend to use these views, but you might find them useful depending upon your work. Feel free to experiment. Also, for what it’s worth, the tools you’ll have at your disposal in the Toolbar will change depending upon which of these options you click. If you enter “Loupe View,” for example, you’ll be able to give your photos a star rating, which isn’t in the Toolbar in the other views (though you can do this at any time just by pressing a number, 1-5, on your keyboard). This lets you look at a miniature version of each photo along the bottom of your screen. It can be useful in certain occasions — say, you’re in the Loupe View (again, looking at a single photo at a time) and you want to go quickly to a photo that is much later within the same folder. I don’t use the filmstrip much, but it may be useful for your work. The Library module does more than just let you view your photos, though — it also lets you organize them. I’ll cover that in a moment, but I’ll give a quick overview of the Develop module first. Editing your photos is one of the crucial steps of photography. It is particularly relevant if you shoot with your camera’s RAW mode, in which case you’re likely to end up with photos that are low-contrast and low-saturation immediately out of camera. 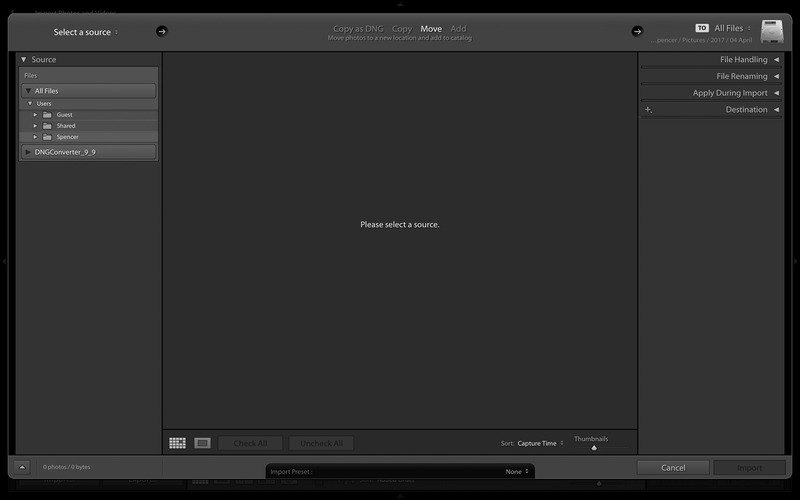 That’s where the Develop module in Lightroom can help. As you can see, there are plenty of post-processing options at the right-hand side of the screen. Most of those are considered global adjustments — in other words, they affect the entire photograph at once. You’ll end up using this right-hand sidebar far more often than any of the other options when you’re post-processing photos in Lightroom. It’s the home base. Almost any time you want to make an edit, this is where you’ll go. 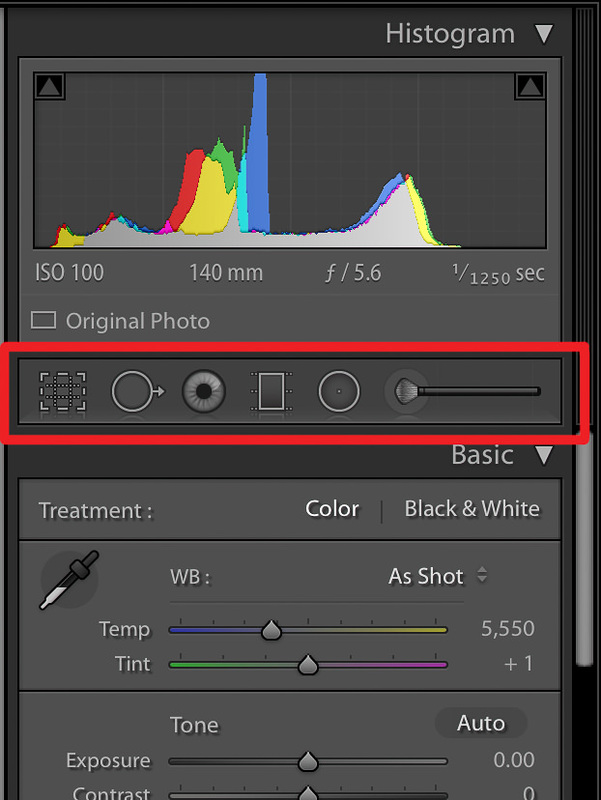 The other crucial tab in Lightroom’s Develop module is the left-hand tab. This section has a few separate options that are each equally useful. Next is the “Snapshots” section. We have a useful video tutorial about Lightroom snapshots that you may want to check out, but the main point is this: A snapshot is a way to remember the exact post-processing settings you used at a particular point in time. If you like the look of an edit that you made, and you want to return to those settings easily (i.e., without undoing all of them manually), you can take a snapshot and return to it at any time. The “History” option is next, and it’s a very useful one. 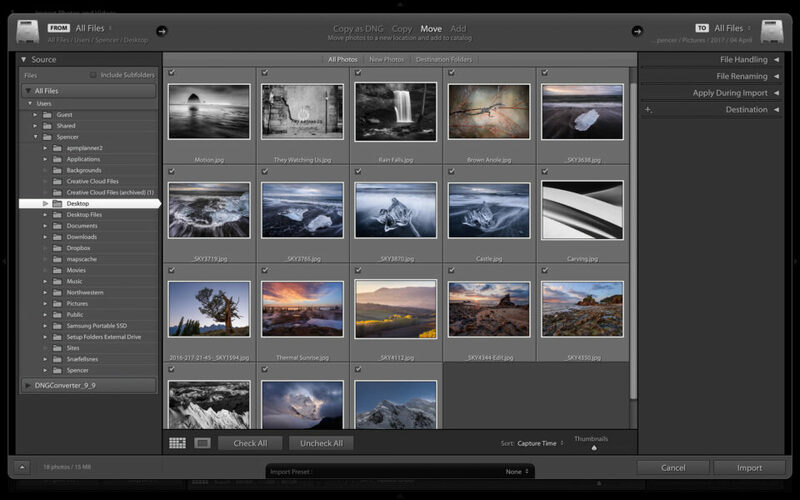 Here, Lightroom essentially takes a snapshot every time you make an edit. So, you can go back, chronologically, to see how the photo looked at any point in its history. I use this all the time to compare my recent edits to an earlier version of the photo. However, if you’ve made a lot of edits to a particular image, this section can get crowded and difficult to navigate exactly where you want. Finally, the “Collections” option is last. As I mentioned earlier, this section also appears in the normal Library module, and I’m not sure that it’s totally necessary here. But, if you have the filmstrip pop-out enabled, you can drag any photo you want into any Collection you want, even within the Develop module. Some photographers may find that useful. The last part of the Develop module’s layout is the toolbar at the bottom. There are only a few options, and you won’t end up using them very frequently. The first option is the view mode of the Develop module. You can view your images with a single photo taking up the screen — which is the most typical way to use the Develop module — or with two photos taking up the screen. In this case, the second photo is the original appearance of the photo out-of-camera. This can be useful if you’re trying to see how drastic your edits were, but it’s not something that most people use very often. You can do something similar, without showing both photos at once, by pressing the “\” key on your keyboard. The other option in the Toolbar is called “Soft Proofing,” and this is a relatively advanced topic. If you’re trying to print a photo, it can be difficult (i.e., really difficult and expensive) to get the colors/contrast/brightness of your image to look exactly the same between your screen and your print. The Soft Proofing option lets you load profiles from your printer and see, roughly, how the photo will look when printed. Personally, even though I really enjoy printing my photos, I rarely use this option. Depending upon how closely you care about one-to-one accuracy between your print and your screen, you should already know whether it will be useful for you. And now that you know the layout of Lightroom, it’s time to dive into the first main function of the software: sorting and organizing your pictures.